Mayor de Blasio is urging drivers to avoid the area around Trump Tower if possible between now and Inauguration Day as President-elect Donald Trump plans his transition to the White House, but that Fifth Avenue will not be permanently closed. De Blasio said that as many as 50 extra officers have been assigned to the tower since election day, but that there are no plans to permanently close Fifth Avenue while Trump continues to plan his administration. "We are devoted to make sure the city will keep moving," de Blasio said. New metal and concrete barricades, scores of police, and pedestrian checkpoints were erected outside the glass skyscraper at East 56th Street and Fifth Avenue after Election Day. 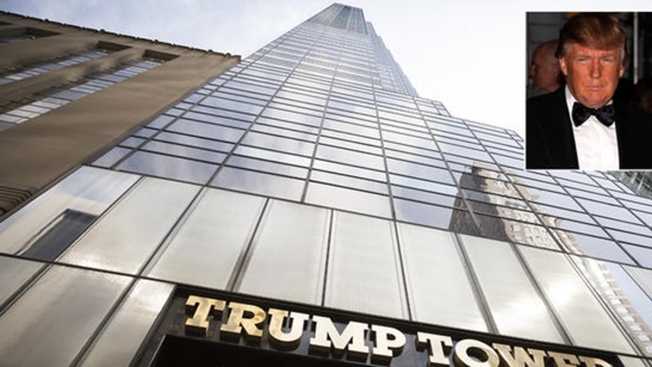 As Donald Trump continues his presidential transition, officials in New York are meeting to figure out how to secure Trump Tower and the area around it. Mayor de Blasio was expected to hold a news conference on security at Trump Tower on Friday. Tracie Strahan reports. Screening locations have also been set up around the building, which includes offices, apartments and a public plaza. East 56th Street has been closed by the building since the Election, along with two lanes of Fifth Avenue. Intermittent closures are still possible along Fifth Avenue as the need arises, officials said. One such instance arose on Friday afternoon, when the president-elect's motorcade headed to his golf course in New Jersey during Friday afternoon's rush hour. The commute caused gridlock in both directions at the Lincoln Tunnel. The measures have done little this week to stop the crowds from gathering 26 floors below where Trump has been holed up interviewing potential cabinet candidates and planning his new administration. It still remains unclear what will happen after Trump is inaugurated. Sources have told NBC 4 New York that Fifth Avenue could be fully or partially closed whenever Trump is in town. "We're still working on a long-range plan," said NYPD Commissioner Jame O'Neill. Donald Trump sat down with his first face-to-face meeting with a head of state as president-elect. Trump met with Japanese Prime Minister Shinzo Abe Thursday. Abe called it a cordial meeting and said he has "great confidence in Trump. Stefan Holt reports. Trump has said that he and his wife Melania will move into the White House after inauguration day, but The New York Times reported last week that the president-elect has considered spending weekends back at Trump Tower, the Trump National Golf Club in Bedminster, New Jersey, or the Mar-a-Lago estate in Palm Beach, Florida.